She was a third hand dog. My brother got her from a lady who ran a day care center (good with children, she said, and it was true) and I got her from my brother. We never really knew how old she was. When I first met her, she looked like a large, wrinkled mole rat on a leash. To keep her cool in the summer, my brother had her coat shaved all the way down to the guard hairs. Her coat grew back with excruciating slowness, starting with a fringe of hair on the underside of her tail, so basically she looked like a mole rat with a plume. Friends would dig for something nice to say and would have to settle for “she’s very sweet” which was true. I quit shaving her coat when I got her and it grew back fabulously. Her mane around her ears made her resemble Farrah Fawcett, circa 1970s. She didn’t like water, preferring to dig holes to cool her tummy in during the summer. The holes served double duty as a blind. She would lie there totally camoflaged in a way you wouldn’t think an orange dog on an expanse of green grass could be. She liked most people with a few exceptions. One of them was my father. He and my mom were separated by the time I got her and on one of the occasions he came to visit, the dog absolutely did not take to him. If he were sitting next to me, she would come and lie down between us. One day, she dragged his clothes out of the guest bedroom (my father, a tough old woodsman, subscribed to the “horizontal filing” system of clothes management) and put them in front of the door, as clear a message as any that he could leave at any time. She liked to eat flies and hornets. First, she would slobber on them so they couldn’t take wing and then she would slurp them up. The stingers didn’t seem to bother her. She also loved garbage and would pass up a bone to gnaw on a plastic container. Following a tip in a magazine, I tried sprinkling the trash with cayenne pepper. That just seemed to improve the flavor for her. She was with me when I moved into my new house and everything there has some memory of her attached to it. When I first moved in, I didn’t have a bed and had to sleep on a styrofoam pad on the floor which she felt ought to be hers. At bedtime, she would race me to the bedroom, take up residence on the pad, and then sulk when I pushed her off. She learned to climb up the spiral staircase (the Death Spiral as I called it), but never mastered climbing down. She was, underneath her fluff, a small dog and could squeeze through spaces you would swear a stubby chow couldn’t possibly fit. I installed a side gate so I could enclose her in the front yard when the fuel delivery man came and she dug out a shallow depression (no more than six inches deep and twelve inches wide) under the gate and was running free in the backyard when I came home from work. At her death, she was certainly 12 years old, perhaps as old as 15, and had enjoyed good health her whole life except for a couple of minor injuries. The end, when it came, was very quick, no lingering. Friday, she was fine. Saturday, she was vomiting and wouldn’t eat. When she hadn’t improved by Sunday morning, I rushed to her to the emergency vet. Their X-rays showed a mass on her liver and the subsequent ultrasound showed growths had spread throughout her abdomen–inoperable. She went to her final rest Monday morning. The lives of dogs, like the lives of men, are short. Unlike us, dogs never fear the future or dwell upon the past. They live in and rejoice in the present. We can learn a lot from them. 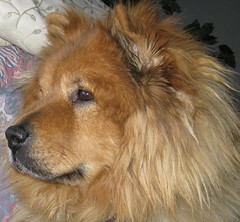 Kandik, without a doubt, was both the orangest and fluffiest dog I have ever had the good fortune to meet. (I don’t think I’ve ever seen a dog come closer to looking like a giant Koosh ball!) She was also a very sweet dog, and she’ll definitely be missed by many of us. All our condolences. I am very sorry for your loss Robyn. It is very difficult losing as faithful a companion as was Kandik. I am sure however, that she is still ‘with’ you and will always be. You know already, my favorite memory of her is the time she expressed her rather blatant rejection of my ‘seasoned’ socks during a dance session with you. Go figure, she relished cayenne sprinkled garbage and even hornets and flies, but literally shuttered and snorted with disgust at the scent of my socks! 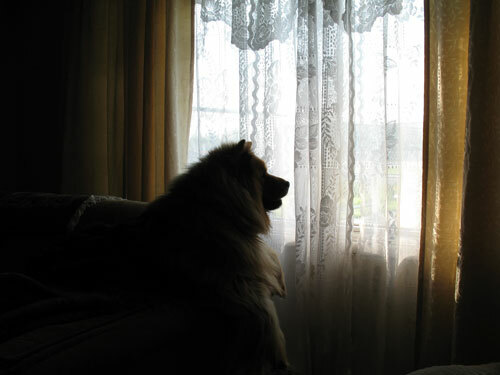 I remember too, her early days with you and her chair in your living room by the window. There was always a feeling of welcome as she waited excitedly watching from the window when visitors arrived. And how she loved the attention. She was a beauty queen that one. Yes, she will ‘live’ with you forever Robyn . I am fortunate to have shared in her spirit. My heart goes out to you.